Do You Ever Wonder What Causes Your Muscle Knots? Muscle knots are a puzzling fact of life for most people. They can occur almost anywhere in your body, but are most commonly found in the muscles of your upper back, neck, and shoulders. They feel like a hard, ropey lump in the belly of the muscle, and can range from being extremely painful to not painful at all. Some knots can cause migraine headaches, shoulder pain, back spasms, and even can compress nerves. While many people have these knots in their muscles, most don’t know what they are or where they come from. To understand what a muscle knot is, you need to know a little bit about the anatomy of your muscles. Made up of layers of fibers, your muscles are layered one on top of the other throughout your body. Most of those muscles, or layers, run in different directions from the ones above or below. In order to perform their function of moving your skeletal structure, your muscles need to be supple and flexible. Muscles knots occur through overuse, recurring positions, frequent dehydration, or an injury to the muscle. Then, the normally pliable muscle layers start to stick to each other, inhibiting movement and function. This adhesion is a muscle knot, and it can feel like a hard lump in an otherwise smooth muscle. 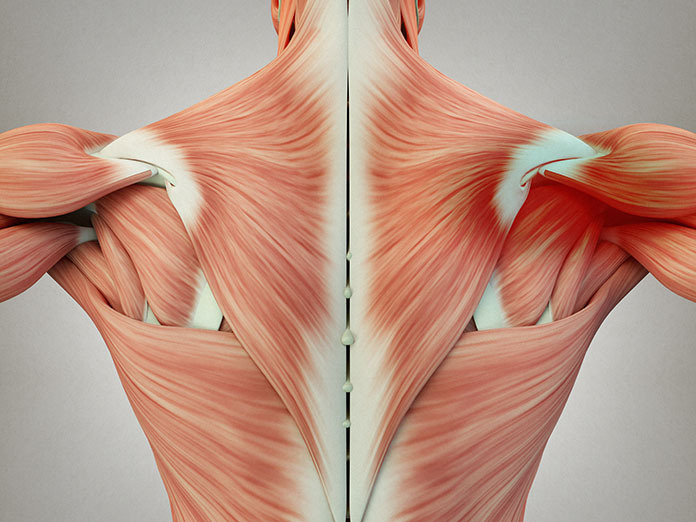 Some muscle knots are no big deal—they may be small and painless. However, large knots, or knots in large muscles can be hyper sensitive or painful. Those knots that are painful or hyper irritable are considered to be trigger points; similar to a muscle knot, but you can point right to it because it hurts. Whether a trigger point or a muscle knot, these adhesions can create scar tissue and cause a loss of muscle function over time. When it comes to Chinese medicine and muscle knots, one of the key theories of good health is that blood and energy need to flow. A muscle knot or trigger point is considered to be a stagnant area in your body, in which flow is hampered. That’s because the adhesion is blocking the movement of the muscle, the circulation of nutrients and blood into the muscle and surrounding tissue, and sometimes your range of motion. Muscle knots, especially painful ones, are also considered to be Ah Shi points in Chinese medicine. Literally meaning “That’s the spot!” Ah Shi points are acupuncture points that are located primarily by palpation, and are tender to the touch. In most cases your acupuncturist will want to locate any Ah Shi points (actually trigger points), and place a needle at that point. While that may sound painful, it actually can be an effective way to loosen up the knot and relieve pain in the area. Another technique your acupuncturist may use to treat a muscle knot involves inserting a needle into the knot, and then gently turning the needle to affect the muscle fibers that have formed the adhesion. This technique is called Stuck Needle, and over a series of treatments can, reduce the size of the knot and relieve any associated pain. Beyond acupuncture, your practitioner has a couple of other tools that can be effective in treating trigger points and muscle knots. One method is a kind of Chinese bodywork, called Tui Na. Similar to massage, Tui Na involves a number of hands-on manipulations to increase circulation in the area, break up the adhesion, and relieve pain. Your practitioner might use a method called Gua Sha, which involves abrading the skin above and around the knot with a flat, hand held tool traditionally made from animal horn, but can also be ceramic, metal, or jade. Gua Sha creates a red mark on your skin, similar to a bruise, which can help loosen the muscle fibers, increase circulation, relieve pain, and promote healing. While it may sound scary and painful, in reality most people who have had Gua Sha will tell you that it actually feels good and is an effective treatment. Physical therapy. A good physical therapist can perform an assessment and help determine the underlying cause of your muscle knot. They’re able to perform massage, manipulations, help stretch the muscle, and send you home with exercises and/or a stretching program to improve strength and functioning in the muscle. Physical therapy is a good adjunct treatment to acupuncture. And as always, make certain that any person putting needles in your body to treat muscle knots is a state licensed acupuncturist. Massage. A number of sessions with a good massage therapist can help boost circulation in the muscle, relieve pain, and help loosen the adhesions. Stretching. Try warming up the affected muscle for a few minutes, then stretch it through its full range of motion. Be gentle, slow, and avoid any stretches that are painful. Lifestyle. If you spend your day hunched over a computer, be sure to take frequent breaks to get up, walk around, and readjust your posture. In addition, stay well-hydrated, check your posture regularly, make regular exercise a habit, and stretch to keep your muscles elastic and pliable. An article discussing the causes of muscle knots and how they can be treated effectively using acupuncture and Chinese medicine.